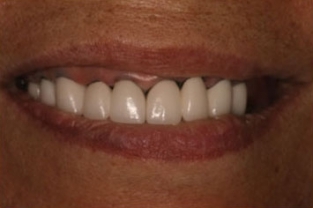 One of the most common ways to replace all missing teeth is to use traditional dentures. However, this approach can have a number of drawbacks. Many patients complain about an uncomfortable fit or about the messy, ineffective dental adhesives required to keep the dentures in place. 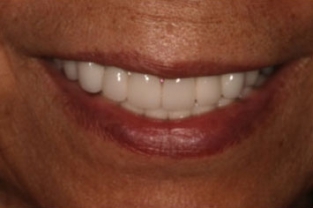 Additionally, traditional dentures cannot preserve facial bone strength and density. Fortunately, there is another option. Implant-supported dentures from our experienced dentist, Dr. Donian Shen, can provide numerous functional and aesthetic benefits. In her hands, your smile can feel whole and natural again. You can also find more information on our Implant Service page. Implant-supported dentures are similar to dental implants in many ways, but there are some important differences. Dental implants, for instance, typically replace one or several missing teeth. Implant-supported dentures, on the other hand, are designed to replace all missing teeth. Both procedures typically begin the same way. You will receive a comprehensive consultation with Dr. Shen, who will evaluate your gum and bone structure to determine if you have adequate tissue for the treatment. If so, she will then surgically implant a number of titanium posts into your jawbone onto which the restorative dentures eventually will be attached. The number of posts needed to optimize your results will depend on your unique needs and goals. Dr. Shen will discuss all of this information with you prior to your operation. Once the implants have fused to the jawbone, Dr. Shen will create an impression and customize your dentures to suit your anatomy and aesthetic desires. Our state-of-the-art techniques and technology help to ensure your outcome is as natural-looking and durable as possible. Once the dentures are finished, Dr. Shen will attach them to your implants. You can then enjoy your newly rebuilt smile with confidence. Our dental implant service can take between four and eight months to complete. Though this may seem lengthy, the process of achieving long-term function and beauty of your teeth should not be rushed. It’s important to note, proper care of your dentures is essential. Just like natural teeth, your dentures should to be brushed and flossed to reduce the risk of damage and decay. Dr. Shen will detail any special instructions for you to follow, though typically implant-supported dentures will be lower-maintenance than traditional dentures. What Are My Tooth Replacement Options for Implant Dentures? Every patient has unique needs and preferences, and we can help you determine which method of restoring your smile offers the best possible outcome based on a number of factors. During your initial consultation, we will talk to you about the following options and guide you toward the solution that can optimize your result. As always, the decision on how to proceed will ultimately be yours. If you want to restore your entire smile, both the upper and lower arches, a full mouth reconstruction may better suit your goals. In this fully-customized, multi-modality procedure, Dr. Shen will utilize the techniques that can deliver an exceptional result both cosmetically and functionally. She is extensively trained in implantology and can provide an outcome you can be proud to show off and confidently wear when eating and speaking. The price of implant dentures will vary from patient to patient, as the procedure is tailored to the individual needs of the person being treated. Dental implants, according to the American Academy of Implant Dentistry, can cost between $3,000 and $4,500 each. In addition, you should factor in the cost of the dental appliance. Implant dentures are an investment designed to last many years, in many cases for the rest of your life. Other methods may be budget-friendly upfront, but could cost more in the long run due to replacements and wear and tear. 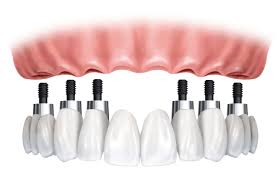 We can help you get the most out of your implant dentures and preserve your smile and your investment. Your denture is relatively easy to maintain. It should be removed at night for cleaning, and you should also clean the abutments set into your jaw. Routine checkups with the dentist are also important, and she will evaluate your appliances to ensure they are in good shape and functioning as desired. If you grind or clench your teeth, it is important to wear a nightguard or eliminate the underlying cause to reduce wear and tear and minimize the risk of damage to your restoration. You will likely find that your implant-supported denture fits more comfortably and securely than a traditional denture and makes eating, drinking, and speaking easier too.